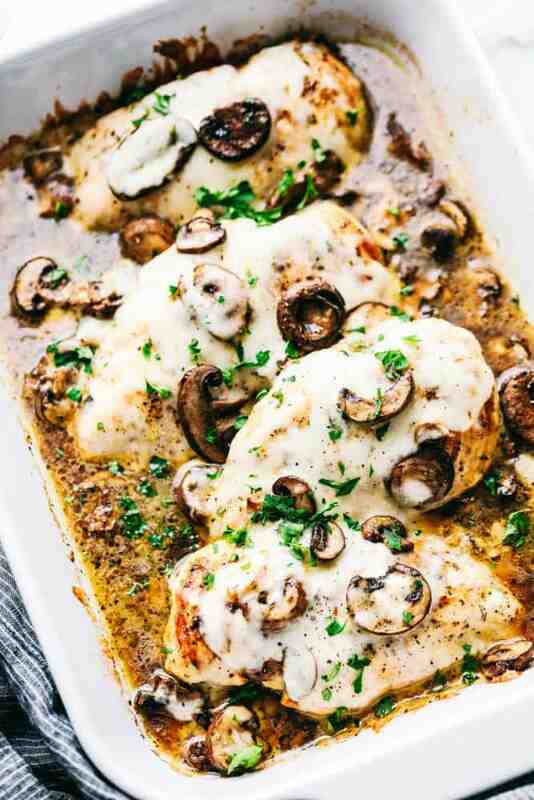 Easy Baked Cheesy Mushroom Chicken has a melted cheese covering the tender chicken breast with flavorful mushrooms and mushroom sauce to enhance every bite. 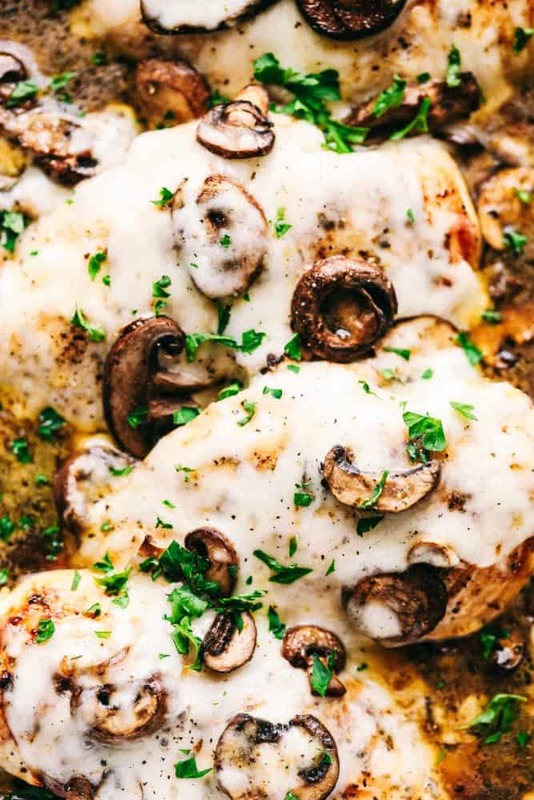 The cheese melts and blend the chicken and mushroom flavors together making a meal that is unforgettable. Preparing this meal is a breeze and gives you more time to spend with your family! 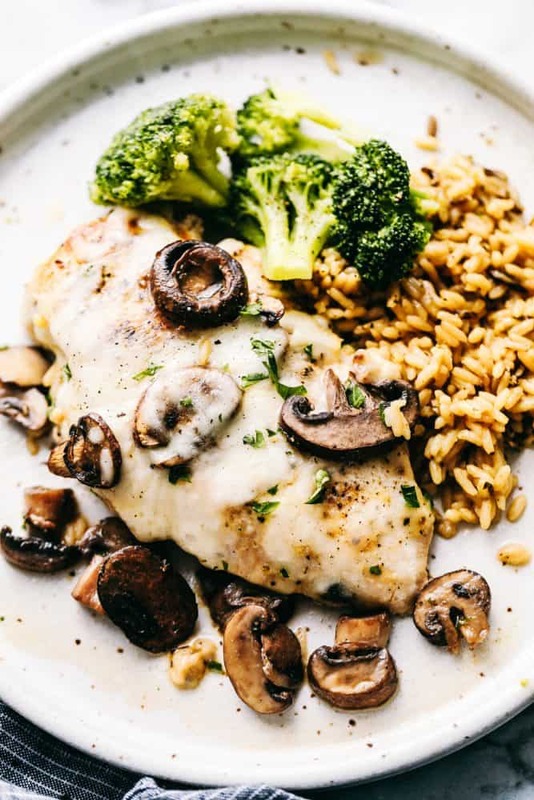 Add this Baked Cheesy Mushroom Chicken to your menu plan this week! This is a classic meal that is bursting with flavor for all to love! Here are more baked chicken recipes to share with your family: One Pan Crispy Garlic Chicken with Veggies, Crispy Baked Onion Chicken, Baked Chicken Avocado Burritos or Easy Baked Pesto Chicken. Sitting down for dinner time is a must for me and enjoying a great conversation with all my kids. They are each at different stages of life but still blend so well with one another. This meal came together so quickly for me and I just had to share it right away once we made it. My sons both had seconds and my girls even loved it too! They all agreed that this was their very favorite meal this week! I felt like a superstar at dinner time. haha. Be prepared for rave reviews at the dinner table! How do you make Easy Baked Cheesy Mushroom Chicken? Preheat oven to 375 degrees F. Salt and pepper chicken breasts and evenly season with Italian seasoning. In a large skillet over medium high heat add the butter. Brown each side of the chicken and place in 9×13 inch baking dish. Add the mushrooms, and chicken broth and simmer until tender. Add to baking dish. Bake for 15 mins uncovered. Top with cheese and bake an additional 5 until cheese is melted and chicken is cooked throughout. How Long Does Baked Chicken bake for at 375 Degrees F? Thaw frozen chicken slowly in your refrigerator, or thaw it faster by putting it in a leak-proof package or plastic bag and submerging in cold tap water. Bake chicken breast in an oven proof dish at 375 degrees F for 15 to 20 minutes or until the chicken is no longer pink inside..
Use a meat thermometer to check that the internal temperature is 165 degrees F (74 degrees C). Do you cover baked chicken with foil? You don’t have to cover this dish with foil. But I do cover most baked chicken with foil. Because the chicken is thinly sliced and you brown it on each side before, it takes a shorter amount of time to cook. If the chicken is thicker and takes longer to cook, the aluminum foil helps seal in the moisture and cook the chicken evenly. What is the internal temperature of a chicken breast? Generally I bake chicken at 350 degrees F. for 30 to 40 minutes. Please check out my very large Internal Temperature Chart for Cooking Meats and Baked Goods. To be sure that the chicken breasts are cooked thoroughly, use a instant digital Cooking or Meat Thermometer for the proper temperature of 165 degrees F.
Are you looking for more Chicken recipes? Here are more for you to enjoy! Preheat oven to 375 degrees. Salt and pepper chicken breasts and evenly season with Italian seasoning. In a large skillet over medium high heat add the butter. Brown each side of the chicken and place in 9x13 inch baking dish. Add the mushrooms, and chicken broth and simmer until tender. Add to baking dish. Bake for 15 mins uncovered. Top with cheese and bake an additional 5 until cheese is melted and chicken is cooked throughout. Garnish with fresh chopped parsley. Can u explain how to print ur recipes ? I am legally blind . That is a great combination too! 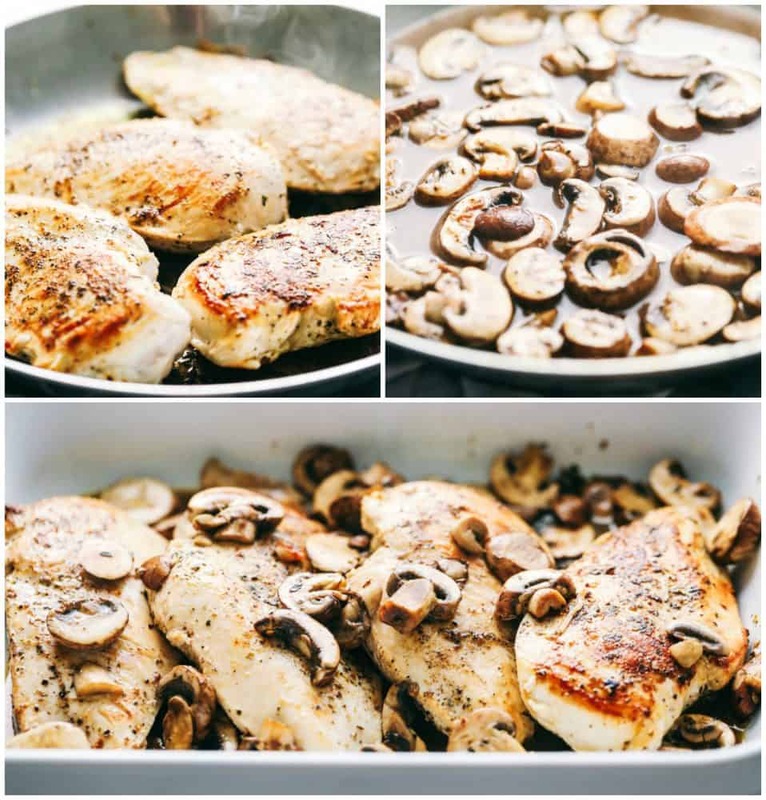 When you add the mushrooms – do I add just the mushrooms or do I also dump the chicken broth in too? Yes, you will add both the mushrooms and chicken broth at the same time.